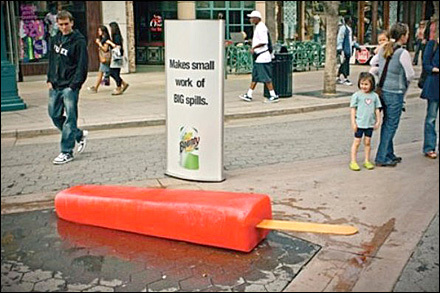 Street art and Branding combine in this “make Small Work of Big Spills” out-of-home campaign by Bounty®. So with it Bounty Says Make Small Work of Street Spills. If it were me, I would cycle this POP-art (pun of POP-art for Point-of-Purchase-Art) across the storefront entries of as many retail chains as possible. 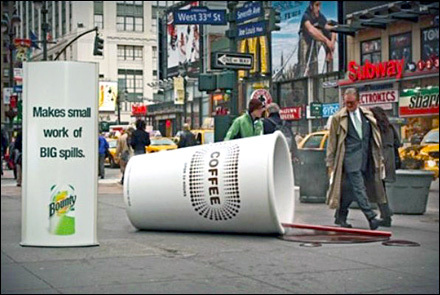 The stores might appreciate the playful street art, and Bounty benefit from top-of-mind position among shoppers. CLICK the thumbnail for a second campaign. “Street Art in Retail Pinterest Board“ visual summary. “Street Art in Retail Index Page” for all resources.